5 km. 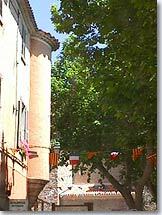 north of Toulon, take route D46 which by passes Mont Faron. 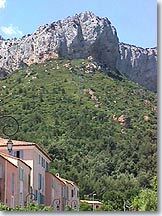 Le Revest is built on a rocky peak overlooked by several mountains: Faron, Caume, and Grand Cap. 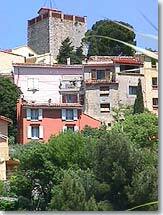 The old village, with its pink roofs, is reflected in the clear waters of the Ragas an artificial lake. The site, and its beauty, make Le Revest les Eaux a special place. This is a nice place for family outings and hikes due to the well kept network of trails. 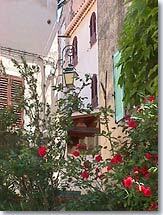 Lovers of plant life will be gratified to see so many typical Provençal species. As you are walking about, you will see the Saracen war tower, which dominates the village, and in the heart of Revest, its castle. This village has always attracted poets and painters. Every two years the Biennale de Peinture is held at the Maison de Comoni. Many artists participate and maintain the quality. The painters and artists are grouped together in the rue des Peintres. Local craftsmen propose their pottery and cerarnics inspired by the light and colors of the village. Le Cabinet des Monnaies and Medailles (numismatics). Walks. Hiking. Horse back riding. Mountain biking. La Valette (5 km), La Farlede (10 km), Sollies-Ville (16 km) and Ollioules (10 km).